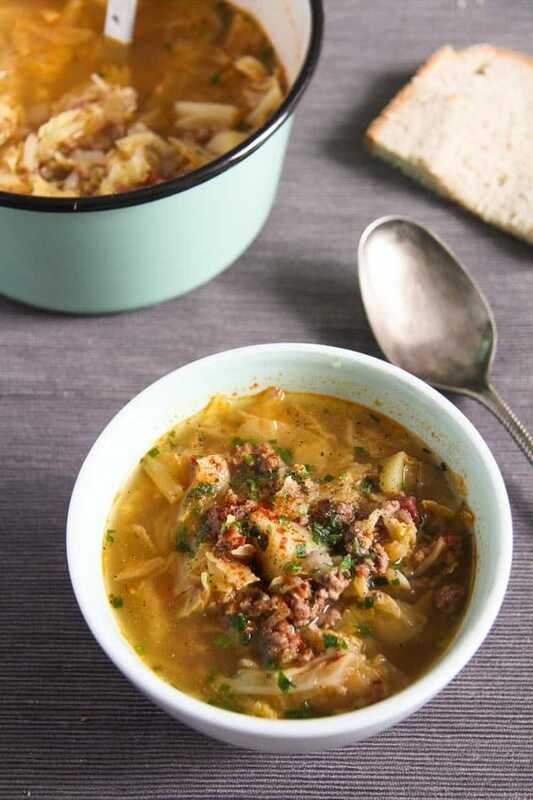 A typical German soup with savoy cabbage, ground meat and potatoes, comforting and delicious, perfect for the cold winter days. 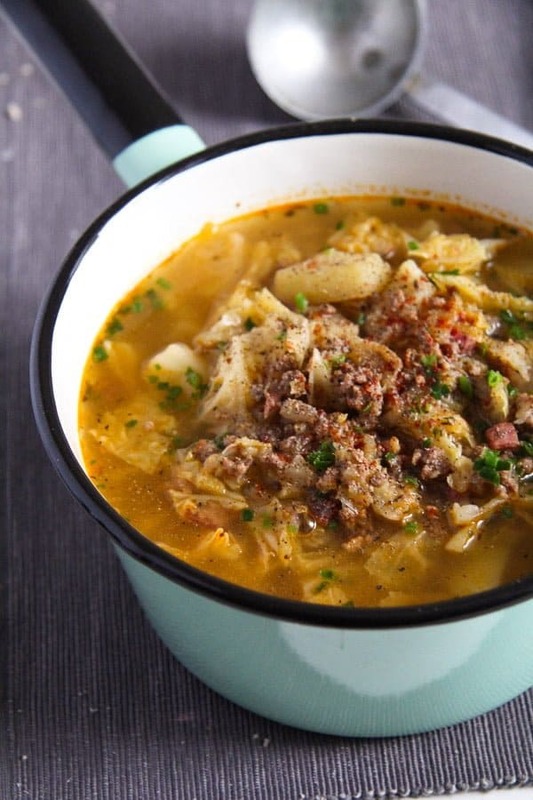 After the Chinese inspired Quick and Spicy Mushroom Egg Noodle Soup and the Indian inspired Spicy Yellow Split Lentils and Beef Soup with Vegetables, I have a German soup for you today, this German Savoy Cabbage Soup with Ground Meat and Potatoes. 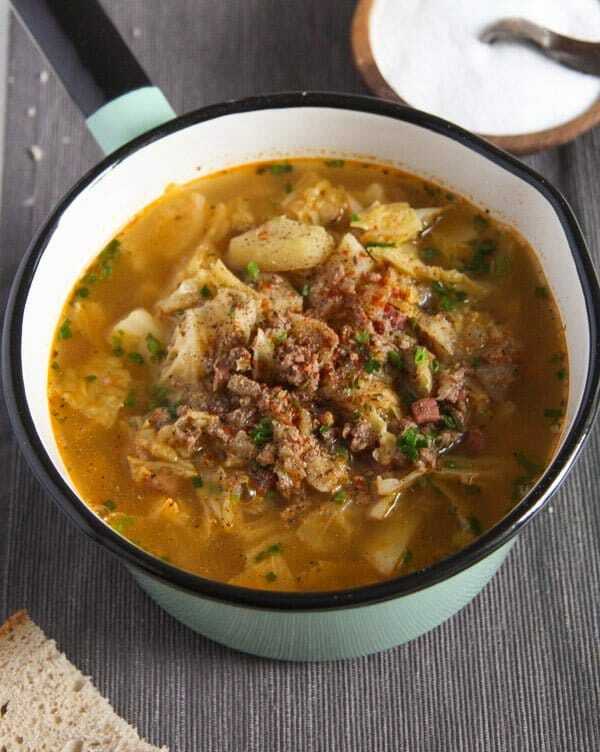 Like mentioned above this is a typical German kind of soup made with cabbage, ground meat and potatoes, there are many similar recipes to be found in the German kitchen, made with white cabbage, pointed cabbage or German kale. 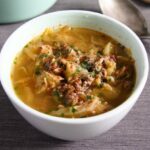 I have tried many of these soups during the past years spent in Germany and I must say I love all of them. 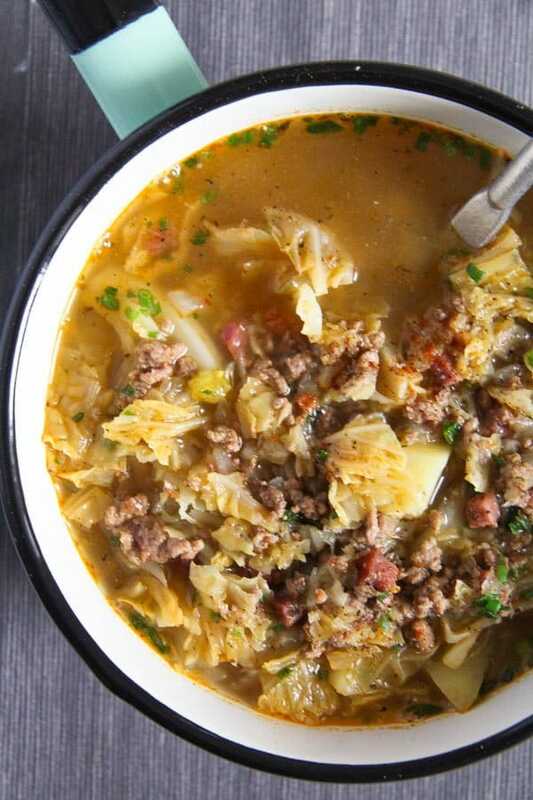 There is something so comforting about a good, hot soup with ground meat and soft potatoes, don’t you think? A soup I would only eat in autumn and winter, I think, when it is really cold outside, nothing for the sunny days, I would rather eat other kinds of soups, lighter ones, something like this Fish Soup with Potatoes and Garlic Sauce or this Delicious Romanian Spinach Dill Soup with Omelet. This is a very easy to make soup, a one-pot affair so to say, the only “challenging” part of it being chopping all those vegetables. Once you’ve done that, there is not much work left to do actually. Just throw everything in the pot, following the indicated succession and wait for the soup to be done. The only thing I feel that I still have to mention is that you should be generous with the freshly ground black pepper, the soup should be a bit spicy and you should be able to taste that black pepper. I think that is an important part of this recipe, you should really feel the black pepper on your tongue. You can serve the soup either as it is or with a dollop of crème fraiche/smetana/sour cream. Chop the savoy cabbage into small pieces. Cut the potatoes into small cubes. Chop the bacon and the onion finely as well. Heat the oil into a heavy bottom soup pot. Give the bacon and the onion to the pot and let cook until the onion is translucent and some of the bacon fat has rendered. Add the ground meat and cook until brown, stirring and breaking the lumps in between. Add both sorts of ground paprika, salt and pepper and stir well. 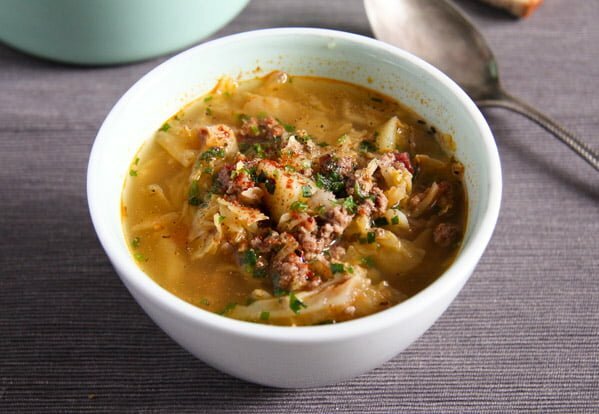 Give the savoy cabbage, potatoes and beef or vegetable broth to the soup pot. Stir well, cover leaving a small crack open and let cook on a medium low heat for about 30 minutes or until the potatoes are tender. Adjust the taste with salt and generously with freshly ground black pepper. Sprinkle with finely chopped chives and serve with a dollop of crème fraiche, if desired. The soup can be reheated, it tastes even better the next day. This looks so good! I love when soups come out a bit spicy, it helps a lot more to eat them on a cold weather for sure!. From the instructions, it does seem pretty simple to make. I would have to try this one day. Thanks for sharing! German cuisine is full of soups featuring ground meat, very hearty and delicious all of them. And many of these thick soups need a lot of pepper, chili is not very typical for old German recipes, so they had to rely on pepper for some spiciness. And it is really a different taste you get, nothing like when using chili. It looks absolutely fantastic! Can’t wait for a cold day to try to make in in sunny Las Vegas! Thank you Christina. Sunny Las Vegas sounds great, here has been so cold lately, time to eat lots of soups again.